A small yet significant event in rock's heritage - recounted by someone who was there. In mid-1969, David Bowie was still a long way from superstar status, despite having been in the music business for several years. He was living in Beckenham with a friend Mary Finnigan, and appearing most Sundays at The Three Tuns pub in Beckenham High Street. The shows began as a way for him and Mary to make a little money and to showcase his talents, but developed into what was christened the Beckenham Arts Lab "Growth". I co-hosted these shows and played as a blues duo with my friend Ken Symonds when Bowie had other engagements. Bowie once told me that he had spent the night in the waiting room on Stockport Station, using his guitar as a pillow after playing at a Folk Club and missing the last train home. As a further development of the Arts Lab idea, and in the hope of raising money to fund permanent premises, it was decided to organise a free festival at Beckenham Recreation Ground on August 16, 1969. Bowie rang round his friends in the music business but didn't get many positive replies from name artists. For example, the manager of Noel Redding (who had just left the Jimi Hendrix Experience and was now leading a group called Fat Mattress) declaired "Noel Redding is a superstar and doesn't play free festivals " . In the end Bowie played solo, and the bill also included singer-songwriters Bridget St John, Kieth Christmas and Toni Visconti. I appeared (invisibly) as a puppeteer in the Brian Cole Puppet Theatre, presenting a rather drug-influenced version of a children's puppet play. There were numerous stalls at the festival selling jewellery, ceramics, herbs and food (including hamburgers cooked in a wheelbarrow by Angela Bowie-to-be). On the day the weather was exceptionally good - and there was no violence either, thank you. 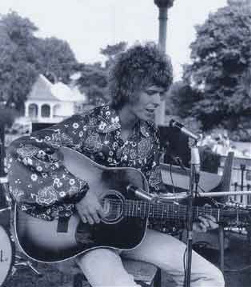 Bowie played many of the tunes which would appear on his Space Oddity album, such as the title track, 'Janine' 'Wide-Eyed Boy From Free Cloud', 'An occasional Dream' and others. David Bowie at Croydon Road August 16, 1969. He was totally professional about his performance, despite being in emotional turmoil - his Father had died on August 5, and been buried five days before the festival. Understandably, Bowie didn't speak much to anyone on the day, nor did he join the rest of us for the final post-festival party in a local Indian restaurant. At the time I was a professional photographer, working for the Ministry Of Defense. At Bowie's request, I took many shots of him, both at the festival and elsewhere. Bowie was flat broke at the time and was unable to pay me. I printed up the picture here and gave it to Bowie, who in turn presented it to his mother. I understand it was her favourite picture of her son for some time and was displayed on the wall of her home. These pages and images are the copyright of Beckenham History and Dave Bebbington.